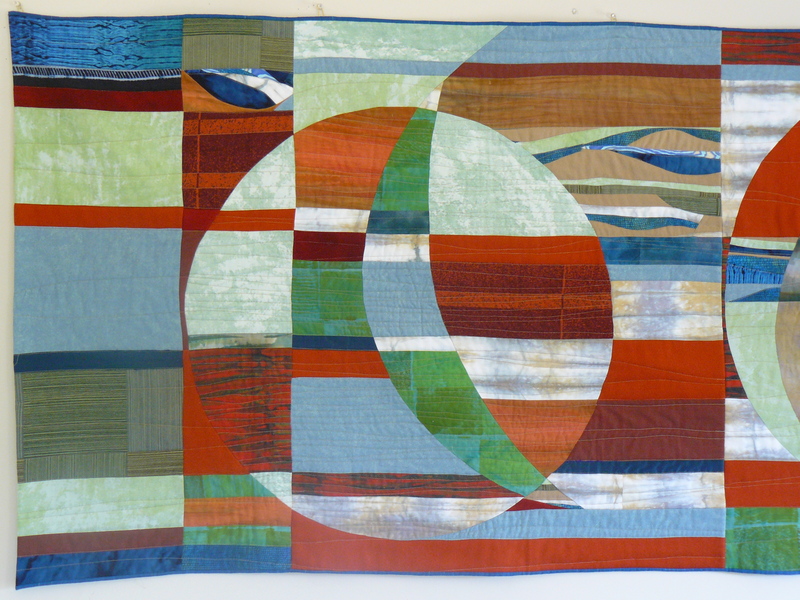 from my forthcoming book "The Yoga of Quilt-Making"
That spring of 2009 I began the more focused, technically oriented work of sewing everything together. 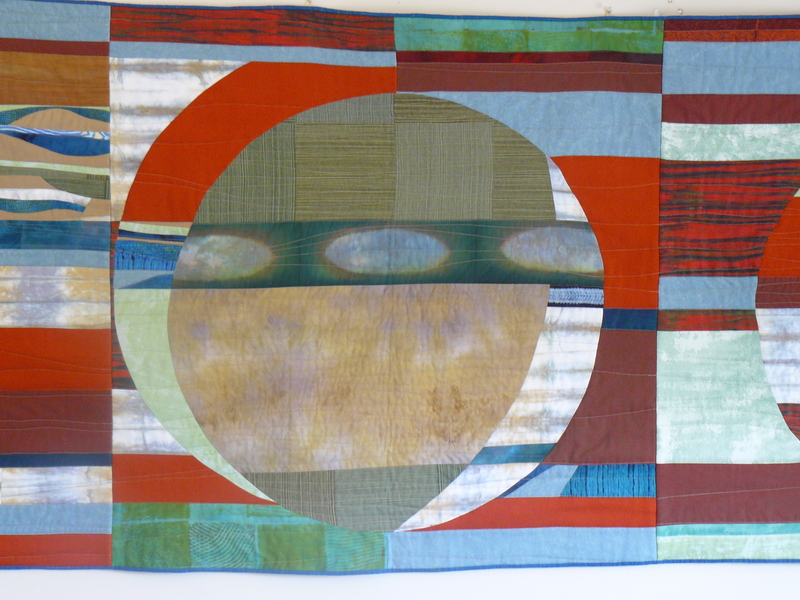 Once each section was completed, the feel of the multitude of pieces now committed to each other carried the impulse to find backing and batting, laboriously baste the three layers of each section in place, and begin thinking about the quilting stitches that would eventually bind the ten foot length together. With the same kind of determined precision, I looked up lover Richard on Facebook and sent him a message. After twenty-nine years the comet had come back around, or maybe it was a Saturn return of our connection. Either way, once contact was made, we delved right back into sharing about our lives and discovering that we had been having many of the same experiences along a similar spiritual path. After many emails of shared intimate detail he offered his belief that the more obstacles we encounter along a spiritual path, the more opportunity we have for personal growth, that we manifest people in our lives to facilitate that growth. He likened this search for our spiritual descendants as ‘living the tribe’. As self proclaimed tribe, we engaged in months of correspondence following this remarkable discovery and re-connection. It was now almost a year since I began the quilt. My daughter was graduating from high school and would shortly leave home. I was graduating from my Energy Medicine program and would shortly find myself face to face with where and how I could maintain the kind of intimacy of experience I had come to value through my training. All the while I was steadily merging together the faces of the many moons that wanted to be seen in the quilt. Or maybe three faces of the same moon. Each had their own identity, while waves of complementary color and form kept them inextricably linked to each other. I began to feel the wind like water moving across each surface, changing the texture of the pattern, prompting another view of the face that has always been there. Each face was now a smooth finished surface of precise seams, and I quilted them reverently with undulating thick machine stitched lines that would eventually interconnect with that of the face next to it. 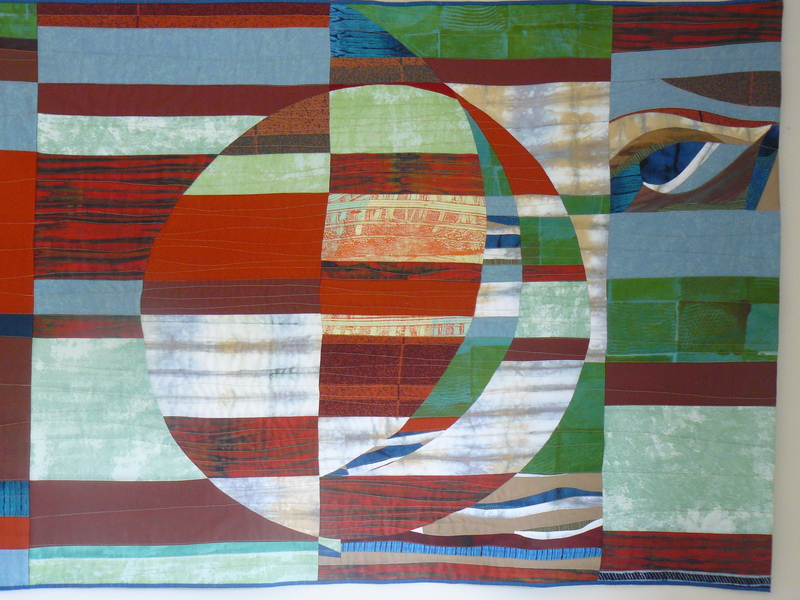 After the three rectangular sections were joined, more wavy quilting lines were added across edges to connect and fix those particular faces in place. Even when the face of lover Richard from the past disappeared again from my life as it did that summer, I knew it would still always be there. The sum of the many transitions during that summer of 2009 led to finally completing the quilt, and into the arms of the next Richard. Partner Richard. Meeting him when I did that autumn of 2009 felt like perfect timing. He was intense, intelligent; connected to his life, land, and spiritual life in ways that attracted me wholeheartedly. 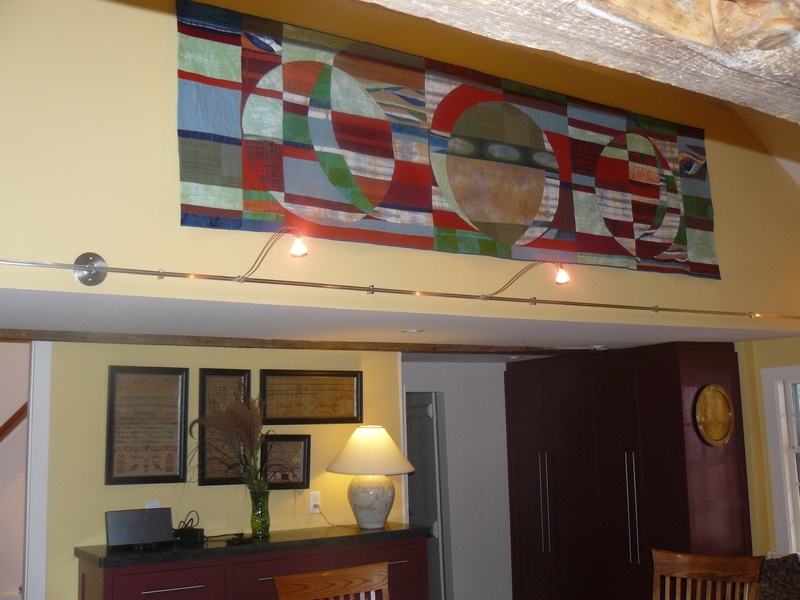 We met through an internet dating service just a few months after I installed the quilt on Margaret’s wall. He occupied the center of the center of the now visible thread of spiritual friends named Richard. Whether teacher, lover, or committed companion, ‘Richard’ was a powerful presence. Each entered into a place in the flow of my growth just when I was ready. As soul-mates, each showed me an aspect of love I had been denying in myself. Margaret was the best kind of patron. She believed in me and my work even if I didn’t. And she was willing to pay for it. The value I placed on the work of the quilt went unquestioned. When I told her that the fee she was be paying me would be financing my trip to California to engage in a one on one intensive session with one of my teachers there, to continue to explore where this path in front of me was leading, she smiled, and showed me the goosebumps on her arm. Our work together was done. Partner Richard pulled the thread of trust a little too tight, and it would be several years before discovering that I wasn’t ready for the unconditional trust in love we desired and aspired to in partnership. We worked really hard together. There was ample common ground, and there was ample conflict. We pushed each other to our limits. It was with great sadness after a year and a half that we ended our relationship. The gift this time was of feeling clarity, and from this, a quality of love and acceptance in letting go. I am grateful to Margaret for her generosity and her intuitive understanding that what was meant to emerge, would emerge. It doesn’t matter that ‘Richard’ to her will never hold the same meaning it does for me. She simply gets to live with this expression of the many faces of love I discovered in the process, every day.